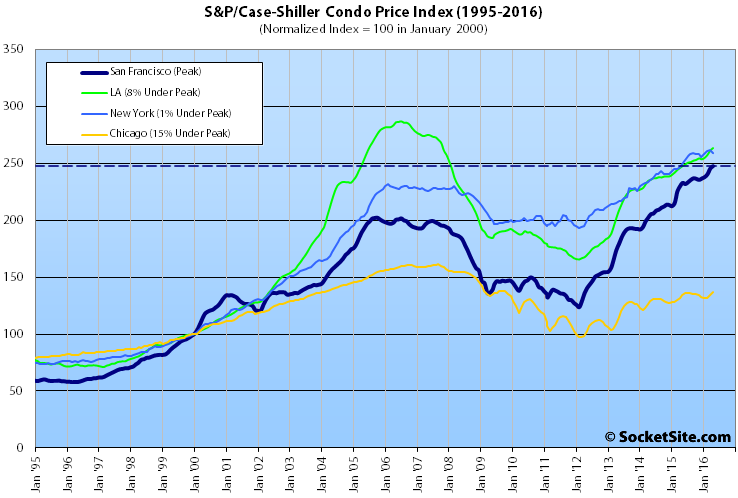 The Case-Shiller Index for single-family home values within the San Francisco Metropolitan Area gained 1.5 percent in April, hitting an all-time high and surpassing the previous cycle peak recorded in May 2006 by 4 percent. But the rate of change has been slowing since the second quarter of 2015, with April’s year-over-year gain of 7.8 percent the second lowest in four years. The index for single-family home values at the bottom third of the market gained 1.6 percent in April, is running 11.3 percent higher versus the same time last year, and has more than doubled since bottoming in 2009, but it remains 15 percent below its 2006 peak. The middle third of the market gained 1.6 percent in April, is running 8.5 percent higher versus the same time last year, has gained 80 percent since 2009, and is now 3 percent above its previous 2006-era peak. And having gained 1.5 percent in April and 72 percent since bottoming in 2009, the index for the top-third of the market is now running 6.8 percent higher on a year-over-year basis and 19.7 percent above its previous cycle peak set in August of 2007. The year-over-year gain is second lowest since the fourth quarter of 2012. The index for San Francisco condo values ticked up 0.8 percent in April to an all-time high which is now 22.4 percent higher than its previous cycle peak in October 2005 and 7.7 percent higher versus the same time last year, the smallest year-over-year gain since mid-2012. The index for home prices across the nation ticked up 1.0 percent from March to April while the year-over-year gain slipped from 5.2 percent in March to 5.0 percent in April and remains 3.2 percent below its July 2006 peak. And for the second month in a row, Portland, Seattle and Denver reported the highest year-over-year gains, up 12.3 percent, 10.7 percent and 9.5 percent respectively. I wouldn’t get too excited. San Francisco sales volume is down around 15% from last May (3 month moving average) which makes it down almost 30% from 2013 peak. It could have something to do with the rapidly falling quality of life. This is more evidence that – at present – there has been no price decline but, at most, only smaller, but still pretty significant (7.8% YOY) price increases. While there may be some hints of headwinds (rising — but still low — inventory, slowing sales, reductions in listing prices), so far those have not translated into anything but a slowing from the extremely rapid price increases of 2013-15 to just strong increases. This was, of course, inevitable. It will be interesting to see if these trends gel into actual price declines, or just a further moderating of price increases. My reading of the numbers is that the condo market has weakened but is still strong per the usual metrics ($/sf, months of inventory, etc.) while the SFR market remains very strong. 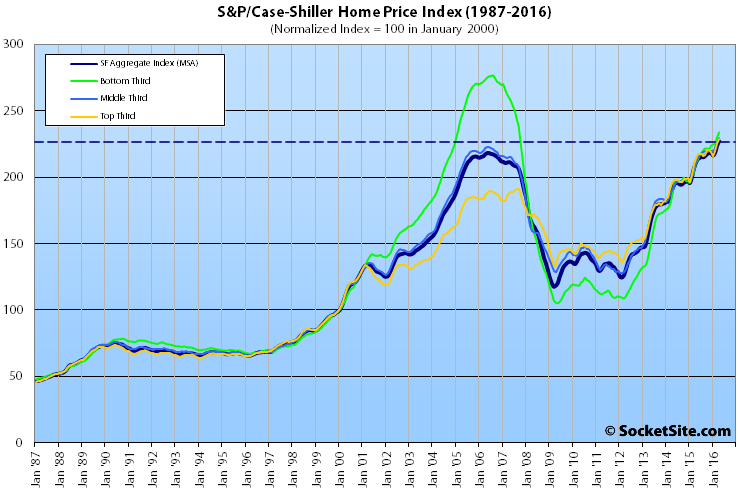 It would be great if we plateaued for a few years or moved roughly with inflation (housing prices are too high imho). But we certainly could see something more negative. As I’ve been saying for about a year, I’d be very reluctant to buy in this market unless I could financially withstand a 10-20% price decline over the next few years — not predicting that will happen and I give that less than 50% odds, but I certainly see it as a not insignificant risk. That said, those betting on 2009-2011 size declines are likely to be disappointed. Pretty accurate but don’t forget two things. Overall, debt has continued to climb; the housing bubble has been replaced by the everything bubble. But the ability of TPTB to respond to the next recession is greatly curtailed by zero interest rates. The next deflationary wave could be very large. Or it could not. Because the actual evidence is that we are not in an everything bubble (or any other kind of bubble). it’s futile to wait for a bubble to pop if there is no bubble. The evidence most certainly does point to a bubble. You are willfully ignoring it. What evidence? Please list what I am ignoring. And how is this different than those who have been calling a bubble for the last four or five years? Home prices exceed income and inflation growth. Stock valuations exceed typical P/E. Business debt exceeds investment. Private tech valuations exceed common sense. Student loans and sub prime auto loans seeing high default rates. People were calling housing bubble in 2005, just because it took until 2009 to pop, doesn’t mean it wasn’t true. PE ratio is maybe on the high side, but a bubble would mean it’s highly over valued. It’s half of what it was in the late 1990s and 1/3 in 2009. Those were bubbles. If the S&P 500 was double its present valuation, I’d agree. If you’re looking for froth, the unicorns and multi-billion companies with no earnings at all are a good place to start. Here is a more nuanced look, in terms of historic deviation this is pretty high up there. Actually for housing 4% is great. 7% is insanely awesome. Otherwise housing mostly keeps up with inflation. I’ll take even odds on a 10-20% drop (I estimate on the low end of that range) in SF from the 2016 peak to a lull sometime in 2017. I’m looking to upgrade my condo to an SFR, but holding out until next year. Not counting on a decline, but a bit more certainty on how prices will hold. Looking a bit now but will pick up the pace in Feb 2017. The 2007 bubble was crazy and fueled by crazy loans and still flattened out for around two years before the decline began. I’d be very surprised if a serious decline began in under a year from now. Interesting to see Seattle and Portland at the top of the YOY gains. It may in part be the techies and other high paid workers moving there. We have neighbors who just sold here and bought in Raleigh Hills (Portland). Solid upper middle class area, views, beautiful homes. I was shocked when they told us they paid 730K. Just a few years back when I was looking in that area the homes were much cheaper. Downside for Portland and Seattle is affordability may begin to take a hit over the next. years. IMO gateway cities such as these will close the gap with the Bay Area in terms of home prices. The Bay Area will remain on top, but the quality of life (in some ways better than here) and growing job base make these two metro areas very, very attractive. This is hardly a new trend. There have been articles about Californians moving to Portland and Seattle seeking more affordable housing for twenty years, at least. This is more of the same. It has accelerated recently with a large segment of those now relocating being techies and other hi-paid individuals. There has been a steady stream of retirees relocating for a long while now who can’t afford it here and/or wanted cash out of their homes. They have not really been a driving factor in home appreciation there for obvious reasons. I’ve been investing in Portland/Vancouver for 10 plus years and price increases were modest. Now they are taking off. I anticipated this would eventually happen as spillover from SV increased. Its a perfect place for Millennials. Anyway, my willingness to wait on significant price appreciation has started to pay off – though I always have had good ROIs. It gets back to my belief that home appreciation will be greater in select gateway cities than it is in the Bay Area in coming years. I think you’re probably right about the rate of appreciation in those cities versus here, especially on a percentage basis. Prices are already so high around here. Exactly. The reason I invested in Portland over Seattle was prices. Seattle is at about 75% of Bay Area prices while Portland is nearer 55%. 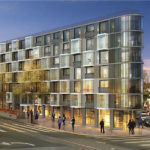 The Vancouver play is that within the Portland market it offers something the growing number of retirees coming from the Bay Area want – no state income tax. And still a bridge drive away from Portland. The Bay Area price baseline is so high that significant percentage appreciation gains from this point are going to be tough to match what may occur in other markets. Related of course is the LinkedIn buyout. My guess is that, over time, the lion’s share of its workforce ends up in the NW. The affordability crisis will eventually impact business here – in a negative way. It is already I’d argue when you see Google and UCSF having to build housing to entice workers to transfer here. That Bay Area cities are not doing more to address this is shortsighted. IMO. Dave, agree with your comments, with one possible and though it’s clear that Sea and PDX are willing and planning to grow much more, could a political/cultural tipping point hit (especially in Seattle proper) that would trigger much more intense NIMBYism? I think it’s possible. Right now Portland is not adding a ton of big tech company jobs, nowhere near the scale of 10s of thousands per year. BTW, I hightly doubt LinkedIn moves significantly out of Bay Area. Now, it may be possible that future LI growth happens in Sea – that is different. Certainly NIBYISM could arise and there is some of that there to begin with. Portland NIMBYs back in the day, 1800s, fought taking out the forests w/in the city proper (mostly SW). They won. Its why large sections of Portland are forested including residential areas like Raleigh Hills and Cedar Hills. Its quite incredible to drive through some of those neighborhoods. Portland is growing but not anything like Seattle. That will mitigate against NIMBYISM. Seattle too has its NIMBYS but there is not the built in anti hi- rise sentiment there is in SF. Seattle will in the next years build a 100 story tower. They want that. There is room to greatly expand their business centers which there is not in SF. Also, both Seattle and Portland are building better looking projects than SF with plenty of greenways. The wall to wall building that is going on in SF is not being replicated to any significant extent in those cities. So you don’t have that backlash. Bottom line, I don’t foresee NIMBYISM becoming the factor it is here. Take that, the affordability and the better quality of life (IMO) and these areas will boom over the coming decade and beyond. IMO. Its why I purchased SFH rentals in the NW and not in the Bay Area. Sounds like you really like Seattle and Portland Dave. Why haven’t you moved there? @SFRentier – my job keeps me from moving. I have a pension and good benefits and 10 plus years with the company. The plan is to move if I can get a transfer, not too likely, or retire there when the time comes. It does not take away from my belief in the long-term advantages of SFH rental investments in the NW as opposed to the Bay Area. I’m SF born and bred but fell in love with the NW after scouting it out for potential investments. Another point Frank. The transportation/gridlock situation in the Bay Area/SF vs Seatle and Portland. Seattle has some specific trouble spots and lots of traffic. But it is nothing compared to SF. Portland does not have a significant transportation problem at this time. In Seattle’s case the promise is to develop/improve transportation as the city builds new offices and residential units. Concurrent development. It remains to be seen how well they do that. However, in SF’s case major new projects are being proposed with no real transportation improvement in sight. Like the Warriors arena. When will there be another BART tube? 20 years if then? The deteriorating transportation situation here adds to the NIMBYISM. For instance, the proposed development of the flower vendor site on 19th into 30 or so units of housing is raising red flags as 19th can’t absorb more traffic and no mitigation is proposed. There is a bike lane on Ocean Avenue between 19th and Sunset. Hardly ever used. One block away there is a bike lane on the heavily used Sloat. It took away a lane for traffic in either direction. That was a pointless move on the City’s part. Put the bikers on the safer Ocean Avenue route for that stretch and keep the auto lanes on Sloat. That move has made the rush hour traffic backup on Sloat worse. That too drives NIMBYISM. Disagree about Portland. We were thinking of moving there, although the traffic in town is still not that bad, the freeways are getting pretty bad. It’s getting the same bad vibes of class warfare as San Francisco, a lot of people live in Portland so they can be artists and slackers etc and are not very happy with it becoming another bourgeois tech hub. Portland is probably the last bigger city left in America that is both cheap and liberal, so it has been near the top of growth and housing appreciation. We are looking elsewhere now because moving there seems like pouring gasoline onto a fire. Agree with your investment emphasis re: upside Dave, although like Portland, the freeway situation in the NW is not great, as Sabbie says. (e.g the 5 in Sea). High growth cities all around the country have some degree of this same problem. Dearly wish SF Bay Area, if they wouldn’t build large amounts of housing, would at least significantly expand rail transit quickly, to connect the east and west/penin/SF….but it’s snail’s pace, if at all. Dave, you can move there in the future if you wish, but you’ll make a lot more money on your SF investment than Portland or Seattle. Those areas have nowhere near the money, drive international exposure or investments that we get. Those areas do better than fly over states, but basically they only thrive when California thrives so much that they get split over effect. When Cali catches a cold, they get pneumonia. No way Seattle nor Portland will appreciate to SF levels. No way, no how…at least not for the next 20-30 years. And beyond that quite frankly I don’t give a sh*t.
You know, it’s not an either/or, nor is it a competition. Both the Bay Area AND the PNW can be poised for continued growth. @SFRentier – I did not say Portland or Seattle will appreciate to SF levels. I said, IMO, they will out-appreciate the Bay Area over the next decade plus. Percentage-wise. A gap in housing prices will remain no doubt with the Bay Area more expensive. I actually make a better ROI on my NW rentals than I would on a Bay Area rental. Not factoring in appreciation which is icing on the cake if it happens. When I purchased I accepted the given of smaller appreciation for a better, immediate, ROI and my expectation appreciation will kick in there down the road. Significant appreciation that is. Which seems to be happening now. Plus, its a heck of a lot easier being a landlord in the NW than it is in SF. And why is SF expensive? Compared to what- London, NYC, HK, Moscow? Heck we’re still a bargain compared to those gateway cities! Even a second tier global city like Tel Aviv gives SF a run for its money, being at a similar $1000 PSF. We have a long way to go before we’re expensive. Come back and talk to me when SF is $3000 PSF. IMO you’d be a damn fool to sell off prime Bay Area RE for provincial pac NW property. Well, except for the last decade, which has just gotten back to flat. And the low tier which is still below the last peak…. @SFRentier – we agree to disagree. Different strokes. BTW, I did not sell off rental RE in the Bay Area. All we own here is our SF (Mt. Davidson area) home. I purchased my first rental in Rocklin (near Sacramento) as I could not afford rental property here. I exchanged my Rocklin property for 3 rentals in Ohio last year. I purchased Portland and Vancouver properties since buying in Rocklin. It is all good and I’m expecting some really nice appreciation out of my NW properties. We have different approaches but I am doing well with my non-Bay Area rentals and I know you are doing well with your Bay Area rentals. All is cool. BTW, I expect a shift of hi-tech out of the Bay Area in the coming decade plus. A lot to the NW. It does not mean that SV won’t remain the center of hi-tech – just that it won’t have the disproportionate share of hi-tech jobs it has now vis a vis other areas..
Looks like NY is at a new peak, not 1% under. It looks like the peak was a month (or two) ago…there seems to be a slight downturn this month. A bigger complaint might be raised that the prices are following a linear, rather than an exponential pattern (i.e. they’re going up a $$ amt, rather than a %age amt, each month) so that price increases seem to be “slowing” but really aren’t. As correctly noted in our chart above, the index for New York condos dropped 1.2 percent in from April to May. Perhaps technically correct in a narrow sense. But more interesting than whether there are month-to-month random fluctuations is how does the current price level compare to the ca 2006 peak. But socketsite thrives on its silly observations, so carry on. You’re the one highlighting items on a chart to draw the reader’s attention to them. One would think you’d want to draw their attention to something interesting and insightful. Some sellers have waited 10 years for this moment — at which prices are finally at the point where they can sell and just about get out of a bad investment with nothing. It’s not surprising that the market is being flooded with inventory at this stage. We’ll get through it and growth will resume once the backlog of 2006 buyers is cleared. Some poster asked the other day what would be so bad about buying right in the face of a 20-25% decline. And right here is the answer. Spend 10 years just to get out with nothing. And looking at the difference between the price tiers gives you some idea of the variance that can occur between properties. And this also illustrates the problem with people looking at the median sales price as a measure of appreciation. As time goes by the homes that people buy get larger and nicer. But if you buy a house in 2016, 10 years from now you won’t have a home representative of the size an amenities of 2026. You’ll just have a 2016 home with 10 years of wear and tear.